I calculated an intrinsic value per share of approximately $60. But at the moment of my calculation, I did not know the historical share price of American Express during 1963-64. What I did know, was that the share price of American Express took a dive due to the Salad Oil Scandal and that Buffett put a great amount of his capital into the stock. As Benjamin Graham liked to say “In the short run, the market is a voting machine but in the long run, it is a weighing machine.” So the question was if Mr. Market did in fact overreact or not in the wake of the Salad Oil Scandal? 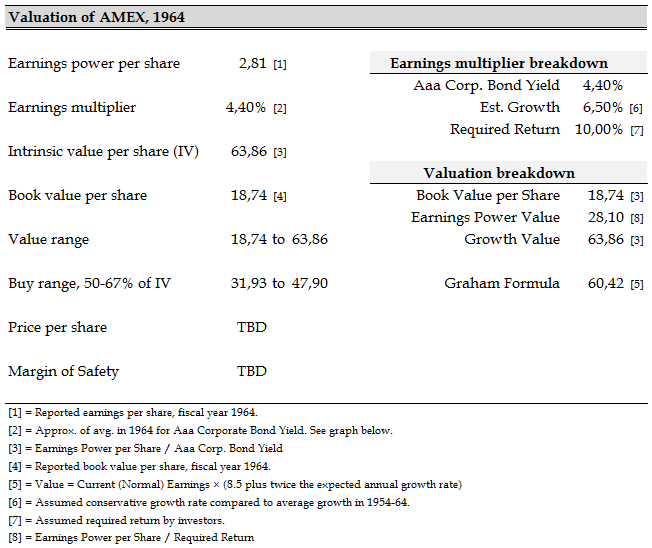 My earlier valuation of AMEX updated with the share price low of $38 in January 1964 resulted in a margin of safety of approximately one third of the calculated intrinsic value per share. So, looking back we can probably understand why Buffett felt that the decline in the AMEX share price presented a great opportunity to buy into this business. But, for this to be a real investment opportunity an investor would also have needed a conservative estimate of any potential liability arising from the Salad Oil Scandal. So, without a proper idea about any potential impact from this event, it would be hard to make an investment due to the fact that a thorough analysis was clearly missing. In the next post I will take a look at what a reasonably and conservative estimate of any liability arising from the Salad Oil Scandal could look like. See annual report for description of the different operating segments. 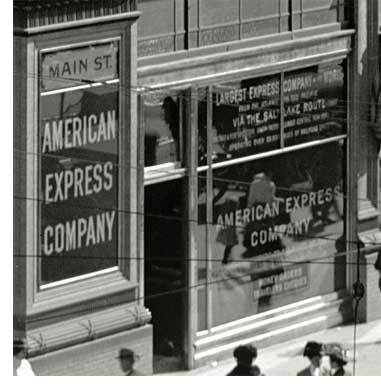 American Express (AMEX) back in 1964 was a growing business that had been able to show strong earnings growth and consistent returns on invested capital from 1954 to 1964. From 1954 to 1964 AMEX grew its revenue from operations at a compounded annual growth rate (CAGR) of 12.1%, from $42,219,000 to $118,144,000. Total revenues, that is including profit on sales of securities, grew at a CAGR of 11.8% from $43,534,000 to $118,441,000. During the same period operating profit and net income grew at a CAGR of 14.0% and 9.7% respectively. Earnings per share in 1964 amounted to $2.81 compared to $1.22 in 1954, a CAGR of 9,7%, and average earnings per share was $1.95. The undistributed earnings ($442,041) from Hertz in 1964 has not been included in earnings above. Approximately 2-4 percent when compared to net income. In 1964 the operating margin was 17.2%, this compared to 14.4% in 1954 and to the 10-year average operating margin of 14.7%. 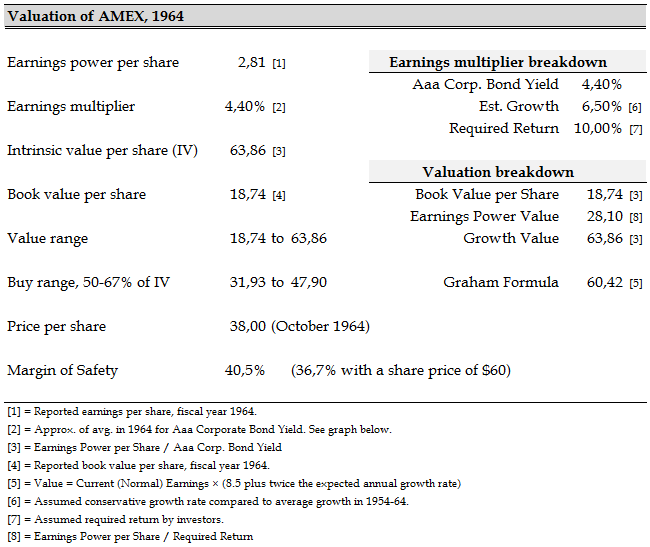 AMEX paid dividends every year that grew from $0.64 per share in 1954 to $1.40 per share in 1964, a CAGR of 9.1%. The ninety-fifth consecutive year of dividend payments. So far we can see consistency in the financial data. Let’s take a loot at what the business had to invest to be able to generate these profits. Total shareholders’ equity amounted to $83,612,591 or $18.74 per share in 1964 compared to $44,296,00 or $9.93 in 1954, a CAGR of 7.3%. During this time period the average dividend payout ratio was approximately 56%. Return on average equity was 15.5% in 1965, this compared to 13.9% in 1954 and to an average return on average equity of 15.0% during 1954 and 1964. Total shareholders’ equity, $83,612,591 (of which Surplus makes up $61,307,301). 6.2% higher compared to prior year and approximately 89% higher compared to 1954. So what we can see is that AMEX back in 1964 was a consistently growing business able to maintain high returns on invested equity capital. Before looking at the fraud that occurred, i.e. the Salad Oil Scandal, making an attempt to value the business as a going concern makes sense, because this makes it possible to compare any liabilities arising from the fraud to an estimated intrinsic value of the business. As of 1964 AMEX is a high return business with favorable long-term growth prospects. Below is my valuation in summary. Looking first at the downside protection (without considering the fraud at the moment) book value per share of $18.74 per share seems like a conservative estimate of intrinsic value. Assets are liquid and there are no intangibles. The liabilities side of the balance sheet is pretty clean. A business like AMEX in 1964 should be valued above book value, this due to the high and consistent returns on invested equity capital coupled with favorable growth prospects going forward. My estimate of intrinsic value, which is at the high end of the value range, points to a value around $60 per share. 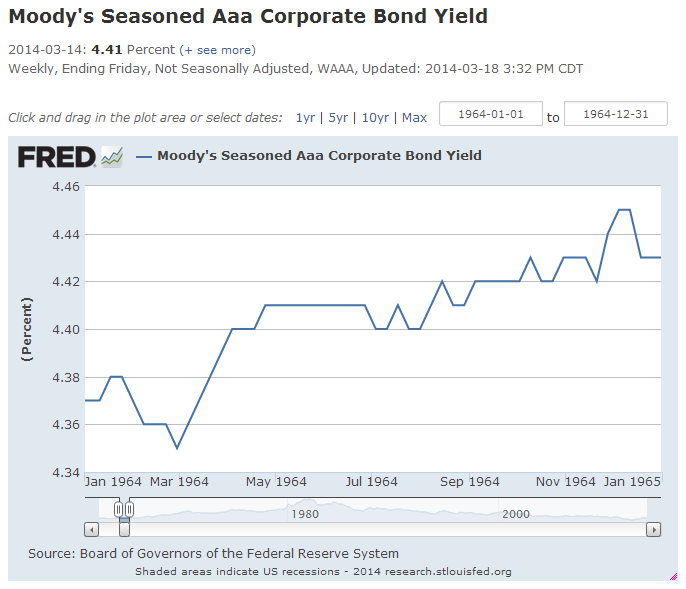 See graph below for the Aaa Corporate Bond Yield from Moody’s in 1964. So, with an intrinsic value around $60 per share, it’s time to go find the share price data to see where an investor could have bought the stock and become a part owner of the business. That’s all for now. Please feel free to leave a comment and share your thoughts and insight. Does an intrinsic value of $60 per share seem reasonable? Or is it too high? Warren Buffett’s investment in American Express in the mid 60’s is well known to a lot of investors that have followed and studied in the footsteps of the Oracle of Omaha. Yesterday I ran into the American Express annual report from 1964 — follow this link to read it. I then had an idea that I would read the annual report and try to come up with a reasonable intrinsic value range of the American Express business and then compare it to the purchase price paid by Warren. Since I didn’t have a clue about the share price – no anchoring bias – I thought it would be interesting to see how my own calculation and reasoning regarding the intrinsic value stood up compared to the price of the business back in 1963 and 1964. So what do I know at the moment that could influence me? How do I try not to be swindled by hindsight bias? …the investment by Warren turned out to be one of his greatest. I will try to imagine myself right in the 60′ (impossible, I know…) and from reading the annual report get me an understanding of the business of American Express back in 1963 and 1964. From the facts in the annual report I will then calculate a reasonable intrinsic value range per share and see at what price I myself would have been interested in purchasing shares in the business and becoming a part owner in it. In step two, I will try to find out Warren Buffett’s purchase price and see where my own calculation stands compared to the price he paid. I will then go back once again, this time to books and articles, to get a better understanding of what happened and how it all played out. As a final step, I will go back to my own calculation of intrinsic business value per share to see if what I know and if my improved understanding of the Salad Oil Scandal would have had any impact on my thinking and my way of coming up with an intrinsic value.